Robert Garnier (Ferte Bernard, Maine) c. 1545 - Le Mans c. 1600), was a French tragic poet. 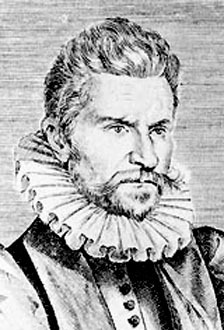 He published his first work while still a law-student at Toulouse, where he won a prize (1565) in the jeux floraux. It was a collection of lyrical pieces, now lost, entitled Plaintes amoureuses de Robert Garnier (1565). After some legal practice at the Parisian bar, he became conseiller du roi au siege présidial and sénéchaussé of Maine, his native district, and later lieutenant-général criminel. His friend Lacroix du Maine says that he enjoyed a great reputation as an orator. He was a distinguished magistrate, of considerable weight in his native province, who gave his leisure to literature, and whose merits as a poet were fully recognized by his own generation. He died probably in 1599 or 1600. In his early plays he was a close follower of the school of dramatists who were inspired by the study of Seneca. In these productions there is little that is strictly dramatic except the form. A tragedy was a series of rhetorical speeches relieved by a lyric chorus. His pieces in this manner are Porcie (published 1568, acted at the Hôtel de Bourgogne in 1573), Cornélie and Hippolyte (both acted in 1573 and printed in 1574). In Porcie the deaths of Cassius, Brutus and Portia are each the subject of an eloquent recital, but the action is confined to the death of the nurse, who alone is allowed to die on the stage. His next group of tragedies Marc-Antoine (1578), La Troade (1579), Antigone (acted and printed 1580) shows an advance on the theatre of Étienne Jodelle and Jacques Grévin, and on his own early plays, in so much that the rhetorical element is accompanied by abundance of action, though this is accomplished by the plan of joining together two virtually independent pieces in the same way. In 1582 and 1583 he produced his two masterpieces Bradamante and Les Juives. In Bradamante, which alone of his plays has no chorus, he cut himself adrift from Senecan models, and sought his subject in Ariosto, the result being what came to be known later as a tragicomedy. The dramatic and romantic story becomes a real drama in Garnier's hands, though even there the lovers, Bradamante and Roger, never meet on the stage. The contest in the mind of Roger supplies a genuine dramatic interest in the manner of Corneille. Gamier must be regarded as the greatest French tragic poet of the Renaissance and the precursor of the baroque theater of the 17th century.